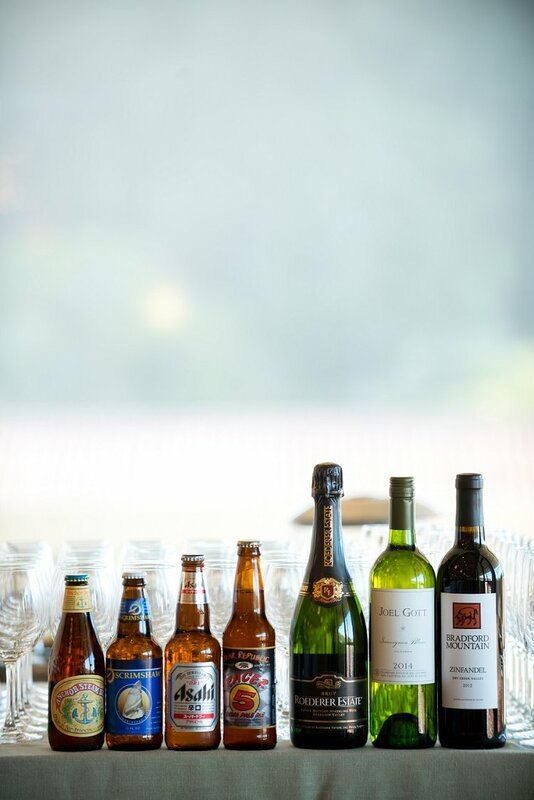 It’s no secret that here at Smashing The Glass, we ADORE the coming together of two diverse cultures. 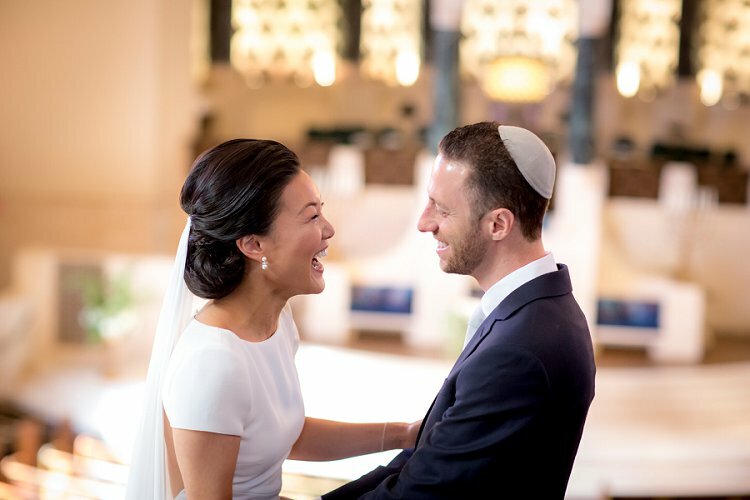 While Kristin is Jewish, and so this is not a Jew-ish wedding, the couple combined elements of bride Kristin’s Japanese-American background with groom Bryan’s Jewish heritage, to create a warm and wonderful celebration like no other. It’s no surprise that this worked so well. 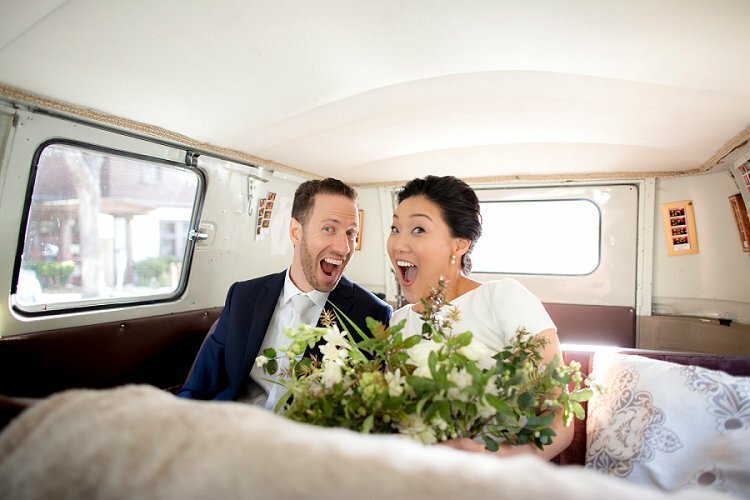 San Francisco-based Kristin is the business owner of Nourish, a lifestyle company that helps people define their cultural narrative on their own terms, and her and Bryan’s wedding was full of heart and placed huge emphasis on the importance of family. 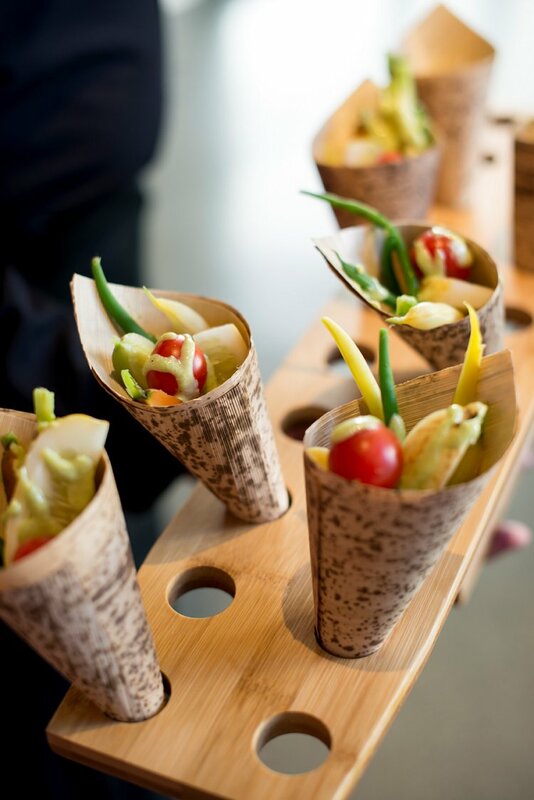 From the home-style meal to the family-centric ceremony, incorporating elements of Japanese culture, every moment honored both families and it’s clear that they are very tight knit. 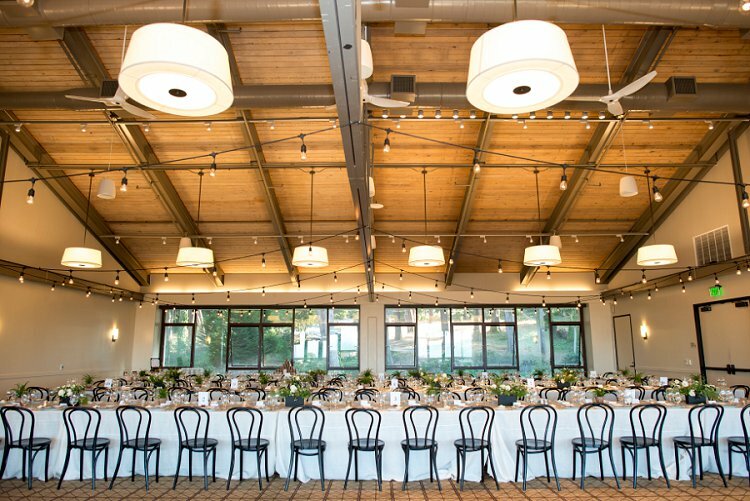 We’re amazed by the story of how the reception venue was discovered. We won’t spoil it for you, but be sure to read carefully, because it’s really something special! 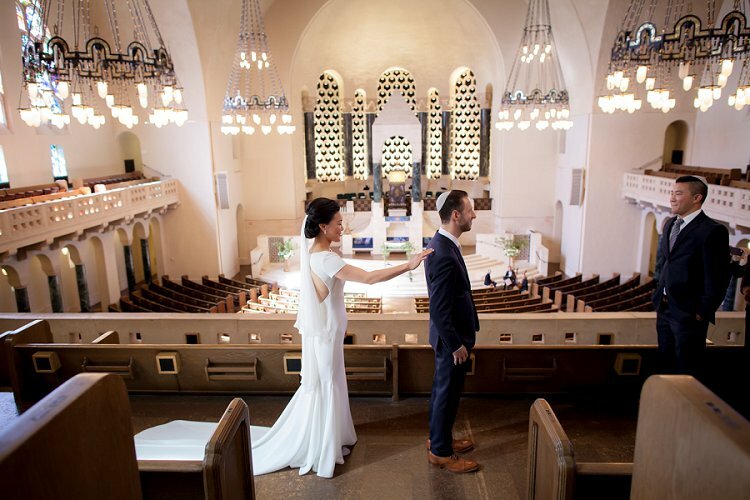 We’re also huge fans of bride Kristin’s cool bridal style, opting for a T-shirt-style dress from Pronovias that totally matched her day-to-day style. 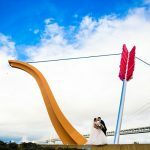 It’s a great example of how to be the best version of yourself on your wedding day. 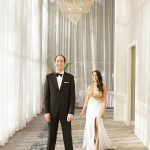 Fabulous STG Recommended Vendor Stephanie Caplan of The Ketubah provided the couple’s beautiful, personalized ketubah, and Perfect Circle Photography captured every detail, as well as all of the emotion, heart and soul of the celebration. 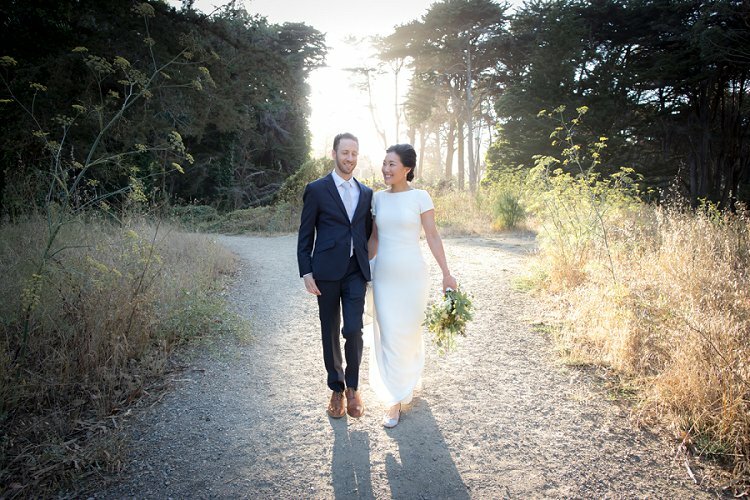 Kristin, the bride: We met on a street corner in Hayes Valley (our neighborhood), San Francisco, where we would often see each other on our way to the bus stop in the morning. For a while, we were just friendly neighbors, until we went on our first date. We began dating, and Bryan proposed on that same street corner where we first met, exactly four years later. 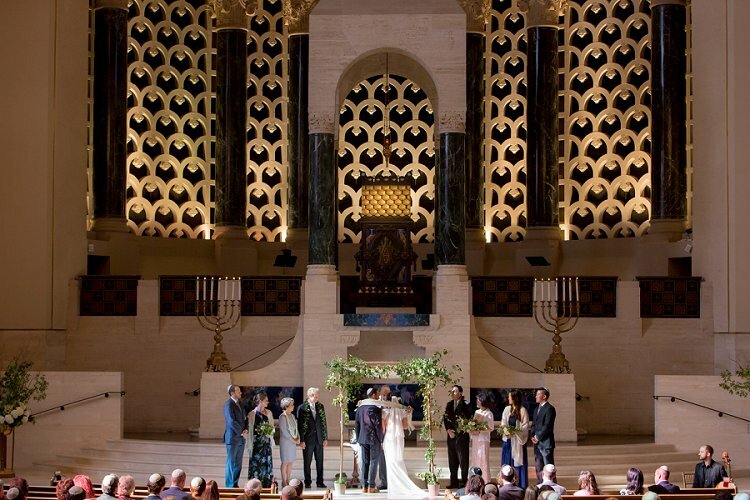 We were married in the main sanctuary of our synagogue, Congregation Emanu-el in San Francisco. We really grappled with this, since we originally wanted to be married somewhere outdoors. 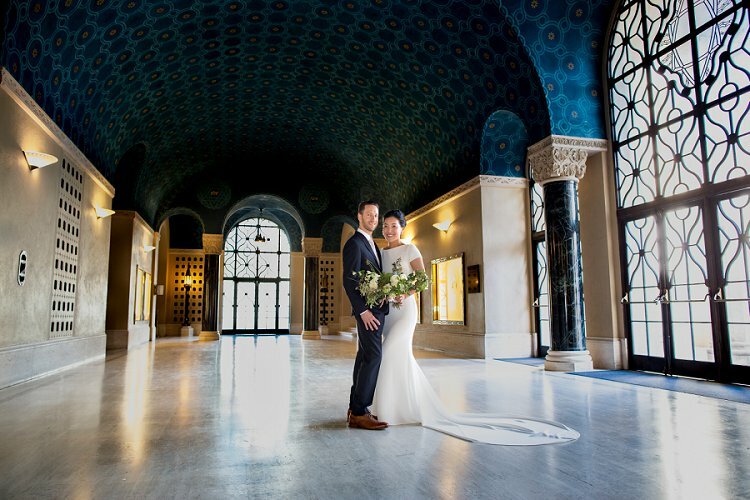 We both really value simplicity and are very casual by nature, so at first we worried that it didn’t feel very “us” to get married in such a grand space. However, we also value places and things with rich histories that are deeply meaningful to us. 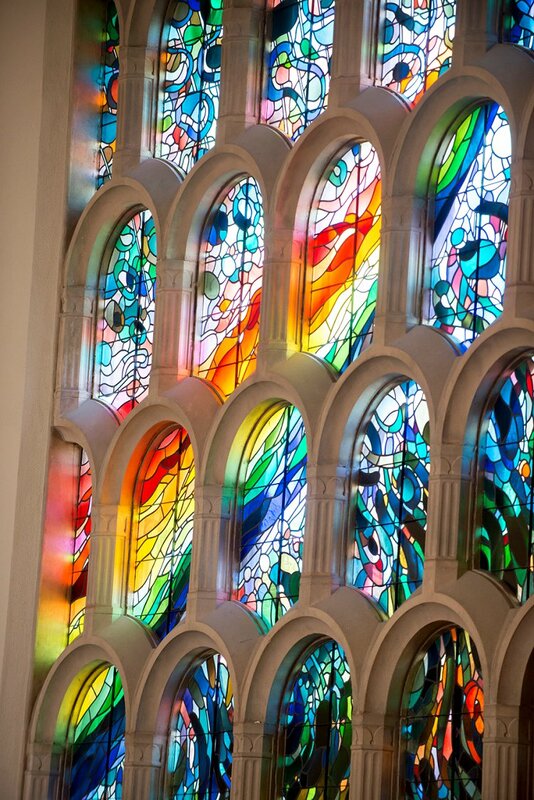 The main sanctuary at Emanu-el is magical: the beauty and energy of the space takes your breath away. 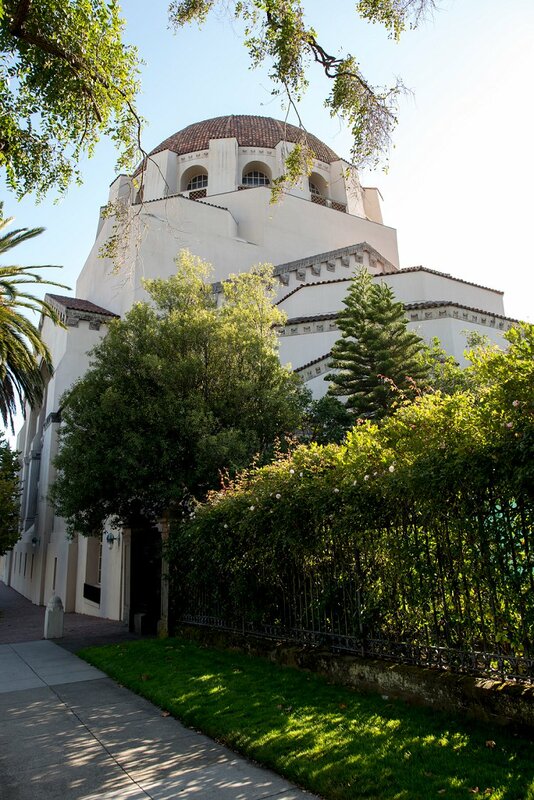 It has served the Jewish community in San Francisco since 1925. That means it’s served the community through wars and thousands of lifecycle events! It’s also the place where I converted, where we have found community, and where we hope our children will grow up one day. 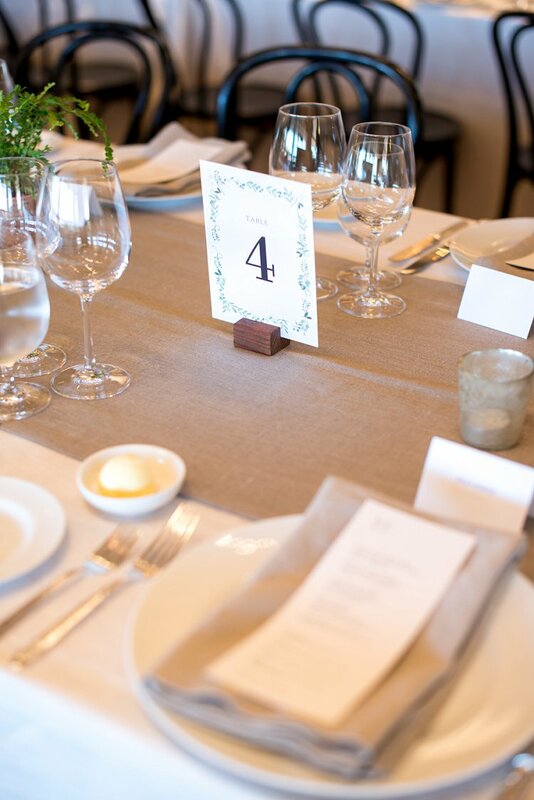 Unlike a restaurant or typical wedding venue, we love the thought that Emanu-el will always be here. We searched for a long time for a reception venue. 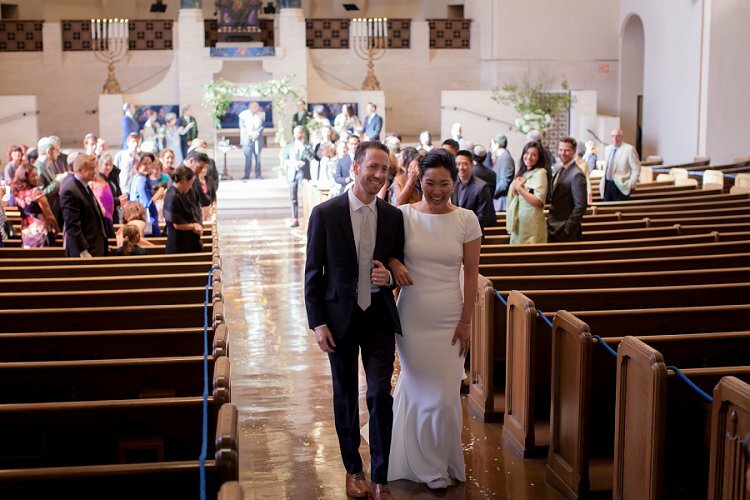 One day, while driving away from a walk through at a venue we didn’t love in the Presidio, we unknowingly drove by the ballroom at the Officer’s Club. Right as we were driving by, we noticed a rainbow over the building and the song we had selected for our first dance started playing. We took this as a sign, and discovered that the ballroom at the Officer’s Club was so newly renovated that we hadn’t heard of it yet! Miraculously, our wedding date was available (we were only a few months from the wedding at this point) so we booked it right away. 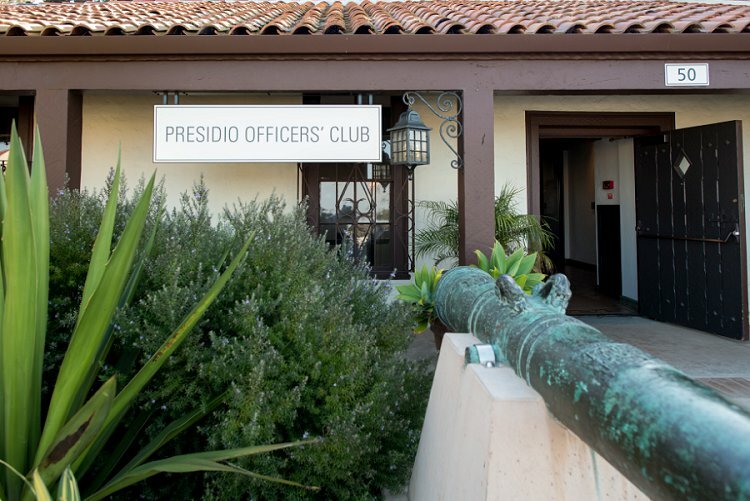 We later found out that Presidio Officer’s Club is also steeped in history; it’s actually the oldest building in San Francisco. 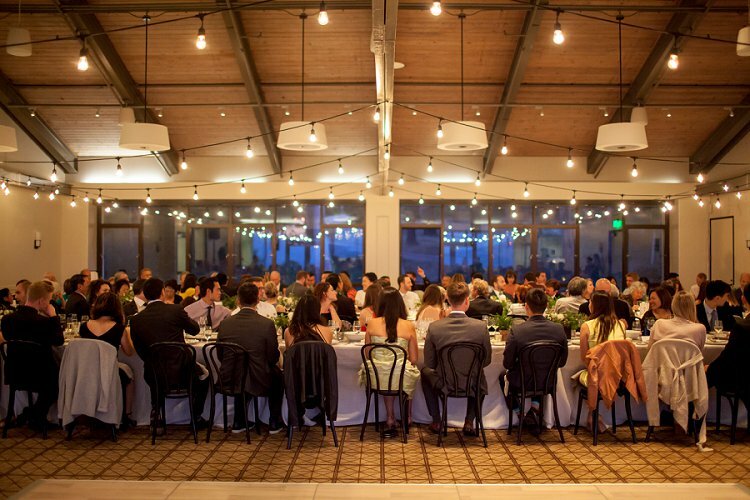 The Officer’s Club is about a five minute car ride from Emanuel-el through Presidio State Park where you drive along the Bay with the best views of Alcatraz and through groves of eucalyptus and cypress trees. We did not have a theme or color scheme. 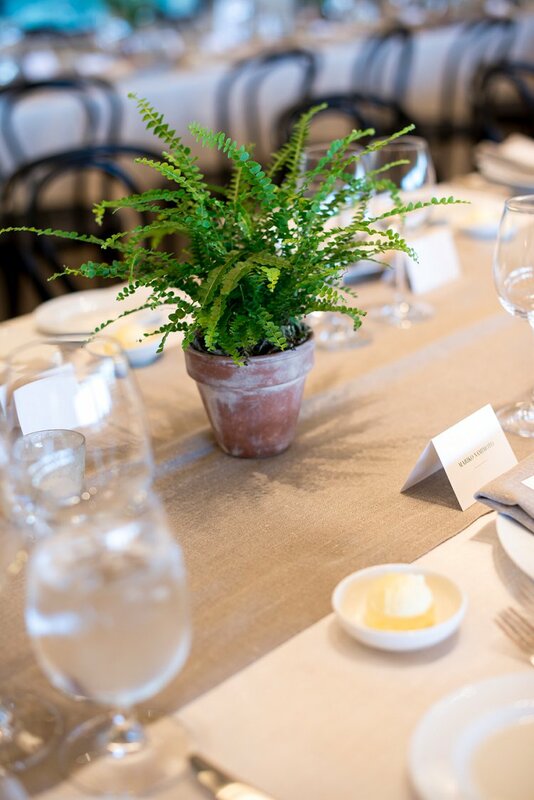 Our wedding style was just what our style is in everyday life: minimalist with touches of heirlooms and meaningful items from our heritages sprinkled in. Since I’ve worked in both event production and interior design, we didn’t work with a planner in the months leading up to the wedding. We did hire a wonderful month-of planner, though. 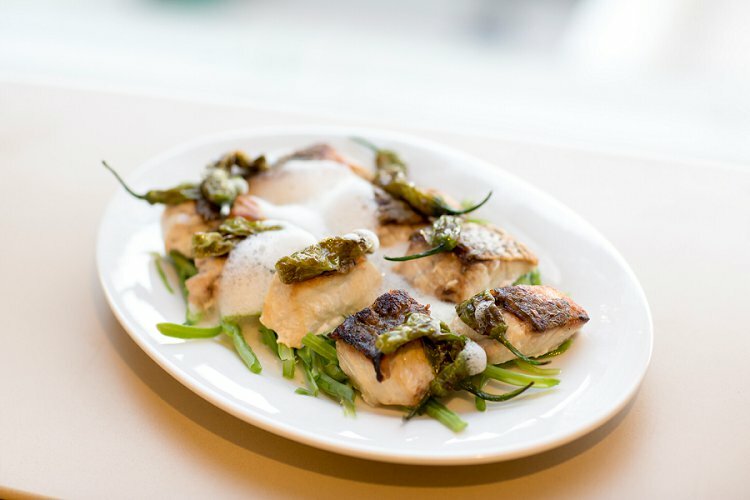 I wanted the dinner to feel like an elevated version of a meal in our home. 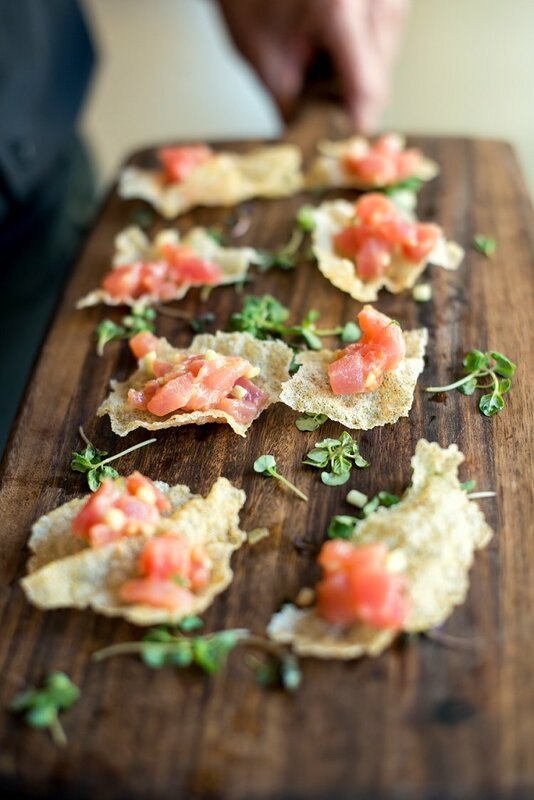 Everything was family style and we incorporated Japanese ingredients like dashi and shisito peppers. We also had bread from local Josey Baker – it’s funny, to this day people still tell me how amazing the bread was at our wedding! Jasmine Chan was actually the first vendor we hired a year and a half before our wedding! I must have contacted her the week we got engaged. She’s done my makeup before for other events and always does an amazing job. I went to so many bridal shops and was actually on my way out of Novella Bridal when I spotted this dress out of the corner of my eye. It wasn’t on any of the racks – it was on a mannequin in a sort of hidden corner. I loved that the dress was cut like a T-shirt in the front, but it had a subtle texture from the luxe crepe fabric. The back was open with this really elegant button detailing. 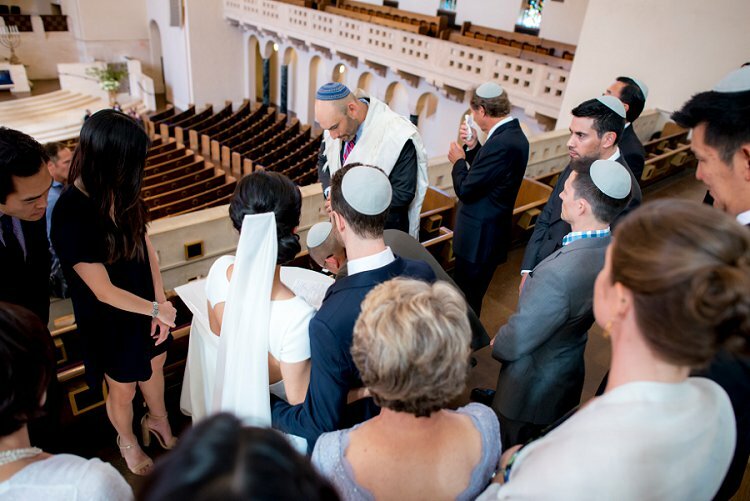 During the Yichud, Bryan shared with me how much he loved how I looked in my dress, especially because it was so perfectly aligned with my style. 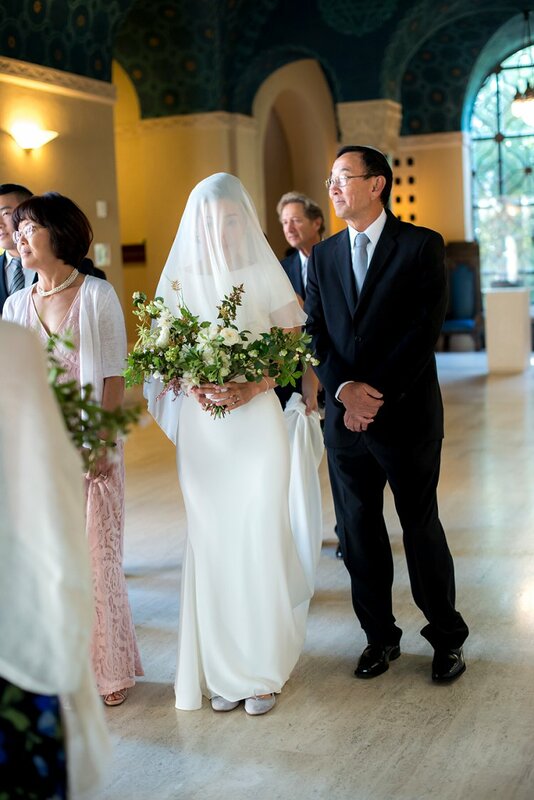 I wore a silk chiffon fingertip veil with a pencil edge. Since the back of the dress was open, I wanted something to cover my back during the ceremony in the sanctuary. For jewelry, I wore a pair of pearl and diamond earrings that belonged to Bryan’s grandma, Ceil, (his paternal grandmother), who I was lucky enough to meet in hospice when we were dating. 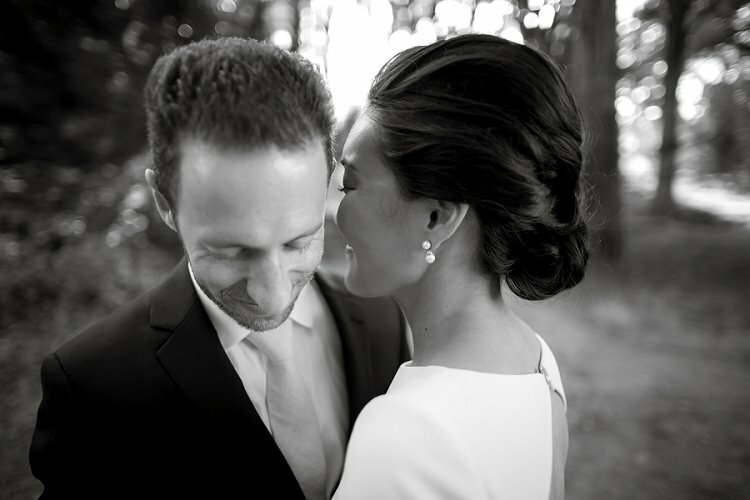 Bryan’s sister, Rachel, also wore the same earrings on her wedding day. My bracelet was made for me by a dear childhood friend out of tiny pearl seeds. Later for the reception, I wore a fragrant gardenia behind my ear. 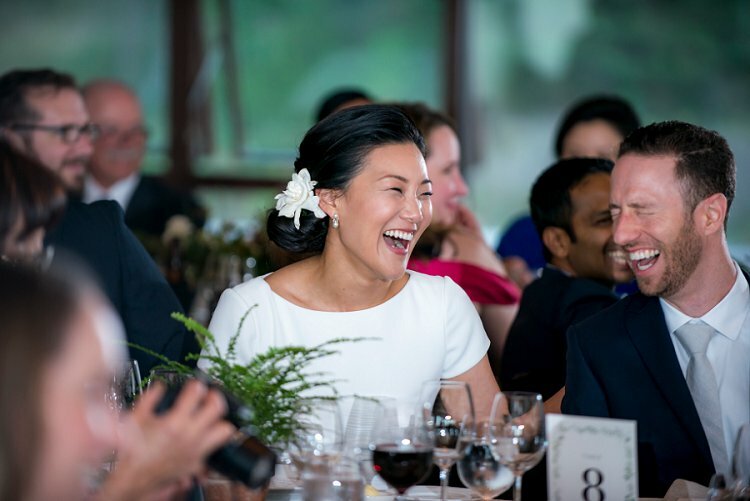 My father is from Hawaii, so I had always wanted to wear a flower behind my ear on my wedding day. My shoes were gray suede ballet flats from Repetto. I don’t own a pair of heels, so I figured it didn’t make sense to start on our wedding day. Repettos are part of my daily uniform, so I bought a special pair for the wedding and felt comfortable all night! 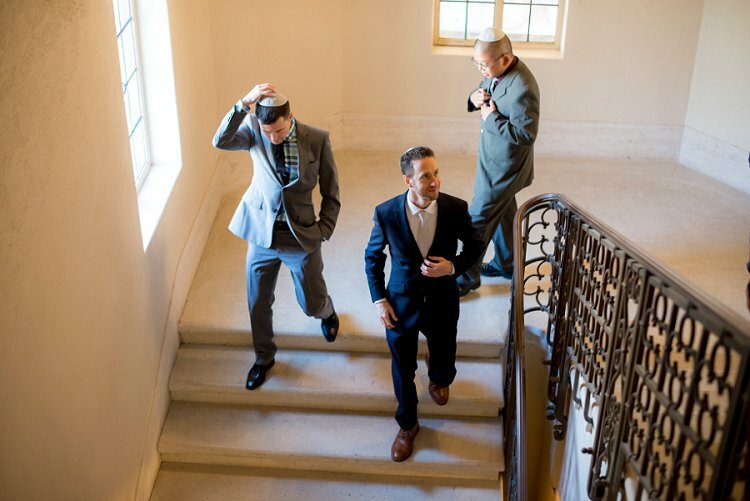 Bryan wore a semi-custom navy blue cashmere-wool-blend Indochino suit. He chose a fun silver polka-dot lining he loved, and had his shirt monogrammed. He wore navy blue pineapple socks as a nod to our love of Hawaii and my dad’s family, who grew up there. 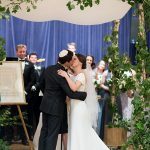 We did not have a bridal party, we just had our immediate families walk down the aisle and stand at the chuppah with us. 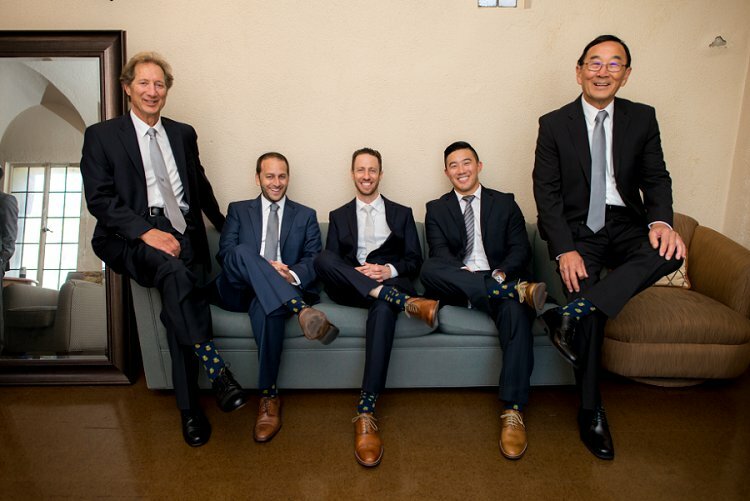 Our fathers and brothers wore their own dark suits, gray ties and pineapple socks that we had gifted them. Our mothers wore their own dresses (which happened to coordinate) and our sisters wore floor-length dresses and beige shawls we had gifted them, to cover their shoulders in the sanctuary. 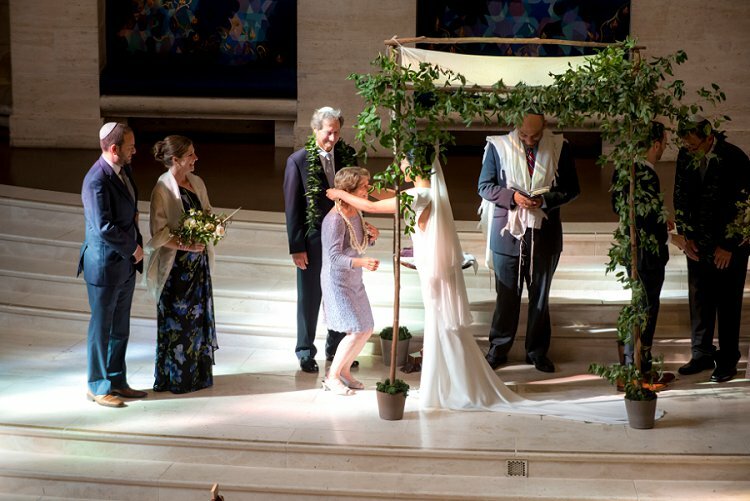 Our chuppah was handmade by Bryan’s father from fallen eucalyptus trees in their neighborhood. 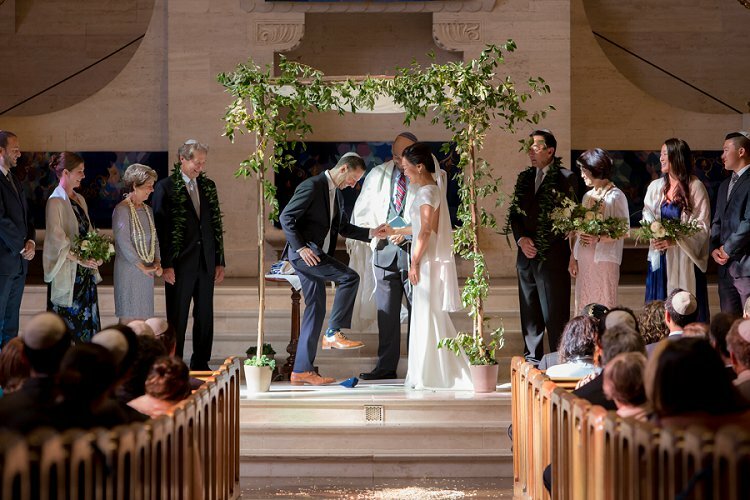 The chuppah covering was made by my mother, from a couple of beautiful Japanese fabrics she selected. We loved that this symbol of our future home was hand-made, by our parents. 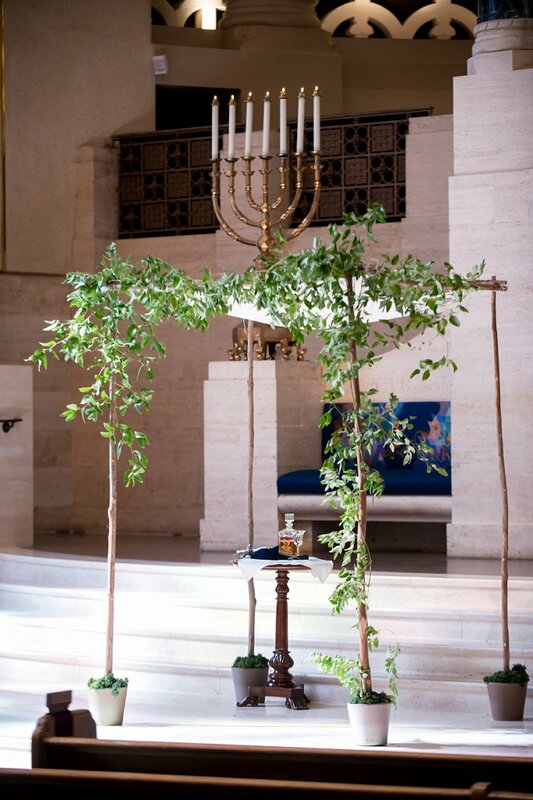 Since Emanu-el is such a beautiful space with intricate architectural details, we wanted something very simple for the floral design and decided that all it needed was asymmetric, simple vines. During the ceremony, we gave our parents pikake leis to our mothers and maile leis to our fathers as a way to honor my dad, who grew up on Kauai. We used Bryan’s grandpa Sam’s (paternal grandfather) tallit during the ceremony. 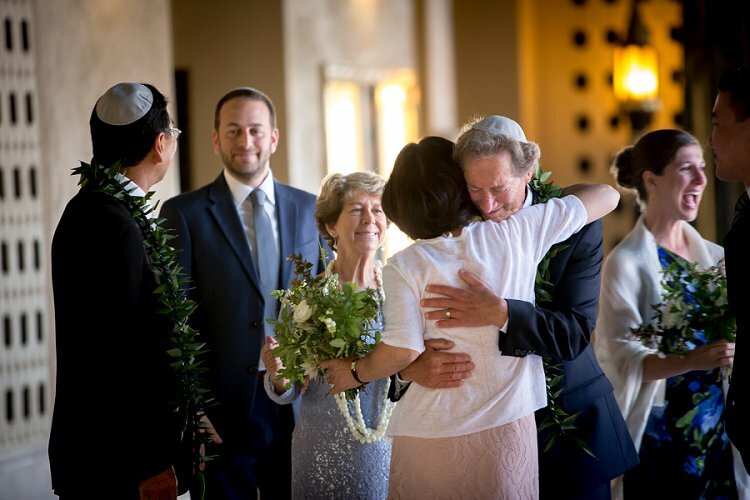 It felt incredibly special to be wrapped in a tallit that’s been passed down in the family. It’s been a part of all of our weddings, so it connects us to each other as well. 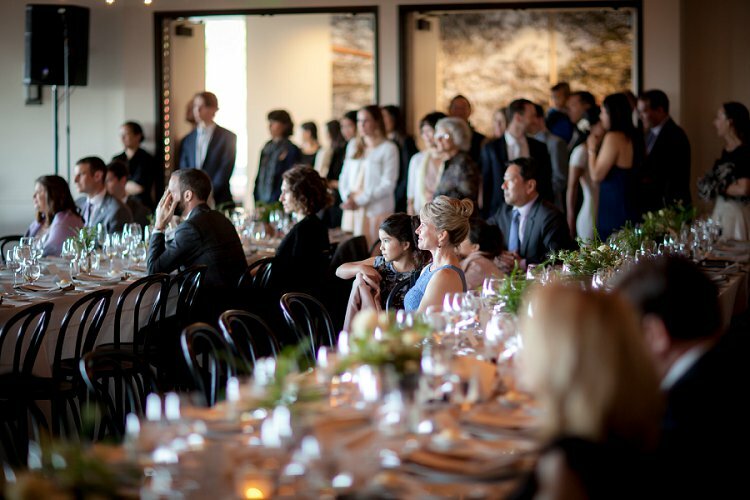 In our programs, we invited our guests to be fully present with us during the ceremony by refraining all cell phone and camera use. Our photographer was also very discreet and kept a distance from us during the ceremony. 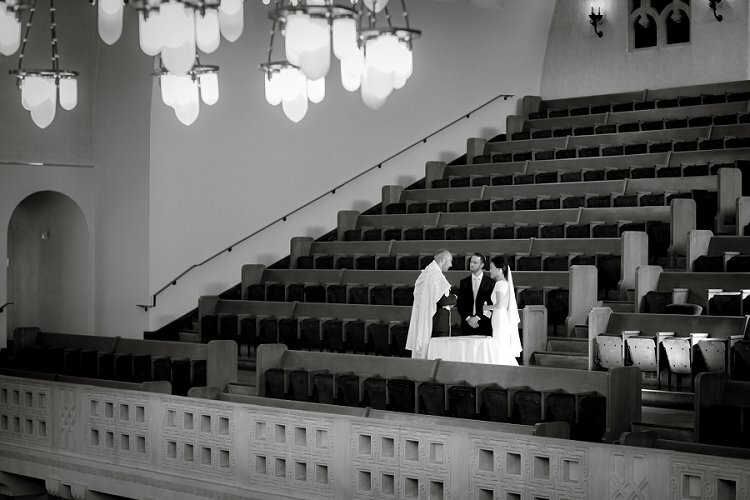 This made our ceremony feel incredibly sacred – it’s one of the best things we decided to do. We loved our ketubah! 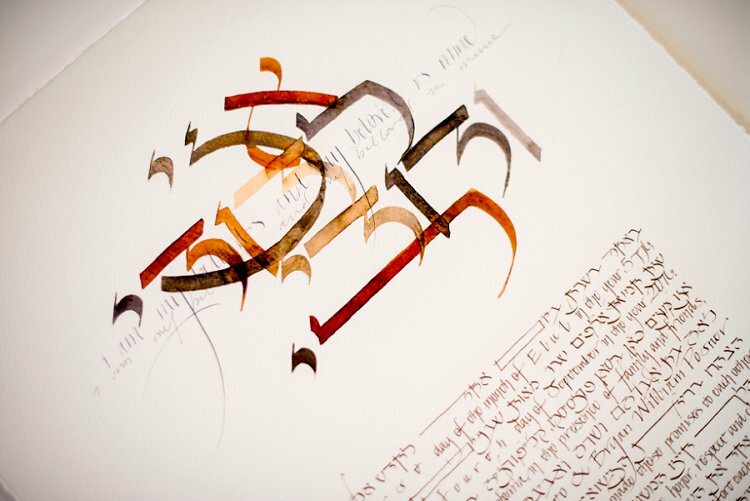 It was designed by Stephanie Caplan of The Ketubah. It was a gift from Bryan’s parents, and it now hangs in our living room, adjacent to our 1,001 origami crane family crest. 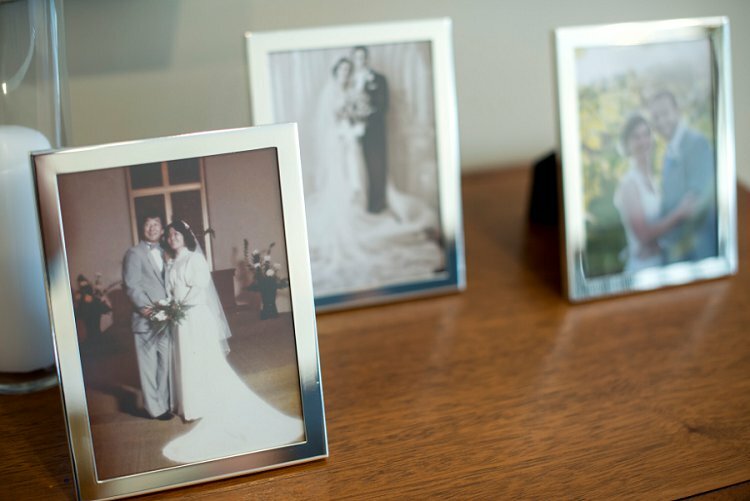 They are some of our most treasured possessions. 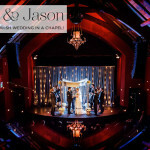 Our dear friend’s cello quartet played during our ceremony in the sanctuary. There is something so soulful about the sound of the cello that paired perfectly with the space. 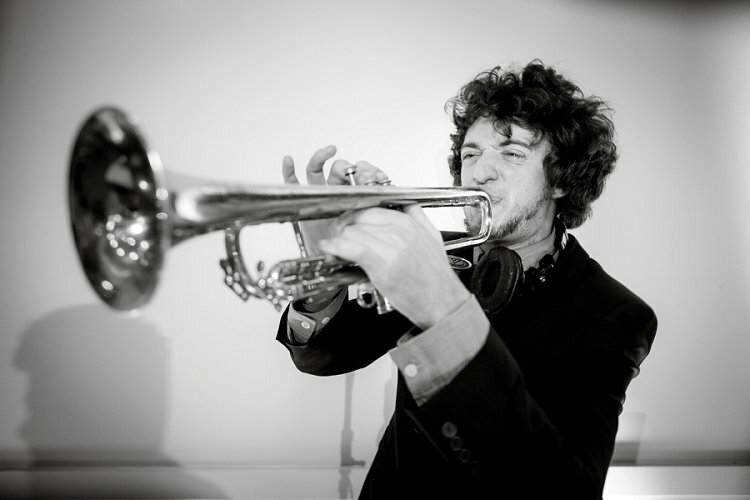 At our reception, our DJ, Will Magid, played the trumpet while DJing. Our first dance song was You Are The Best Thing by Ray LaMontagne. Will asked everyone to join us for our first dance. 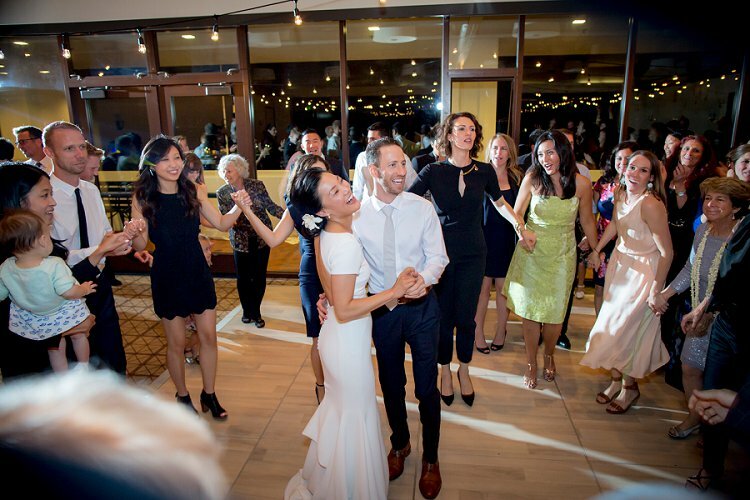 It got everyone on the dance floor, and it was incredibly special to be surrounded by everyone we love during our first dance together as husband and wife. Will also played a funk hora on his trumpet, which was awesome! We LOVED our photographer. 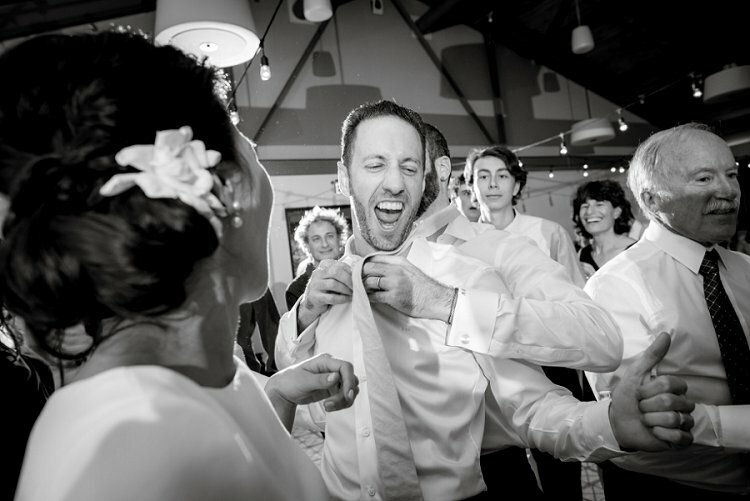 He shot our friends’ wedding in Paris and we loved his photo-journalistic style. 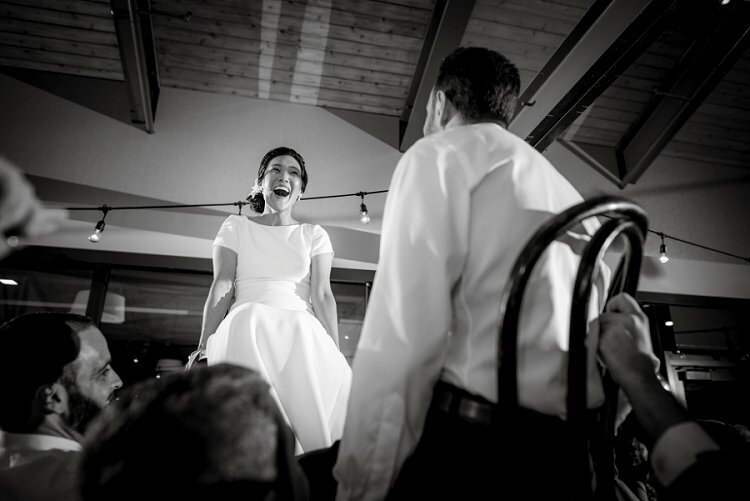 Since we decided against hiring a videographer, it was important to us to capture the emotion of the day and all the little moments with our guests that we might have missed. 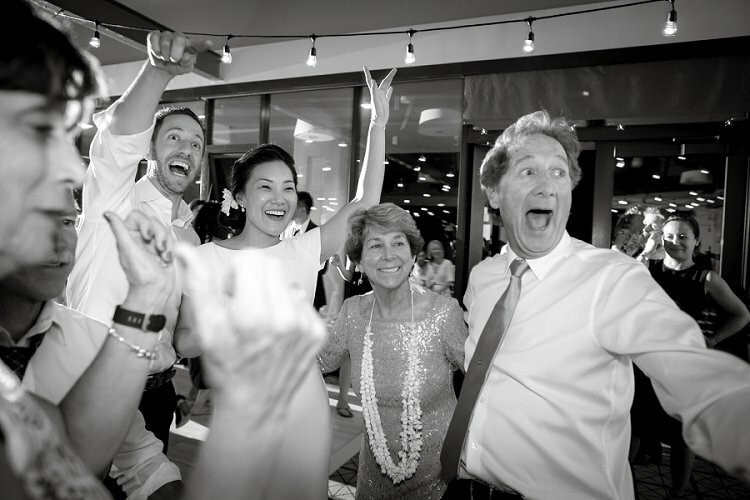 Perfect Circle Photography struck the perfect balance of very discreetly capturing the most sacred moments, while also getting down on the dancefloor and documenting the best moments of the party. 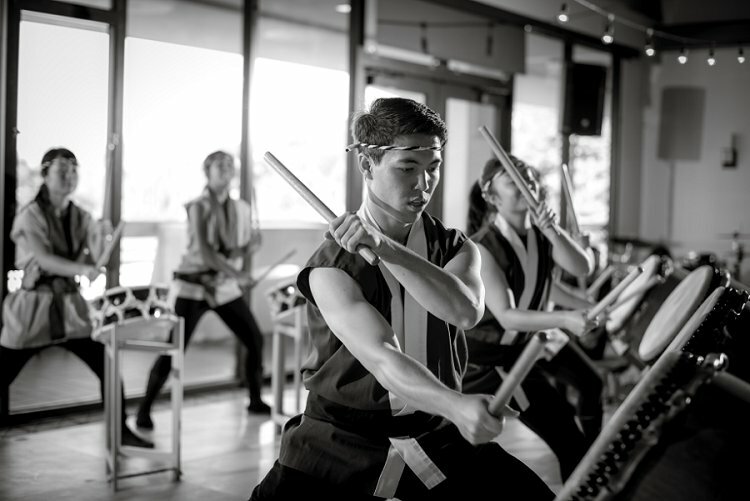 We arranged a surprise taiko (traditional Japanese drumming) performance with the UC Berkeley Student Taiko Group. The started playing as guests made their way upstairs to dinner after the cocktail reception. They were incredible! We snuck in around this time, since we didn’t want to do a big entrance. To my surprise, my mom and my aunt (her sister), who I had grown up spending summers with in Japan, were so touched that they were in tears. 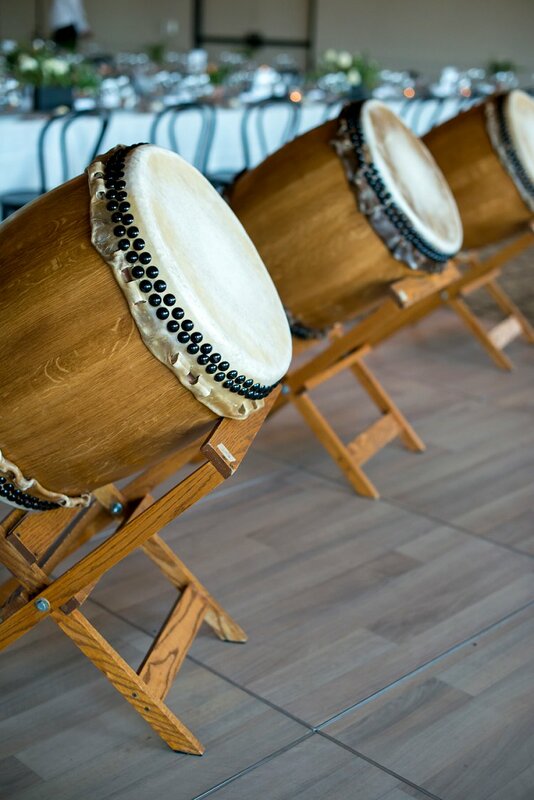 The sound of the taiko is really powerful, and it was such a fun and meaningful way for us to transition into dinner. After we went up in chairs during the hora, our friends unexpectedly lifted our parents in chairs. Our parents originally didn’t want to do this, but I’m so glad we did! 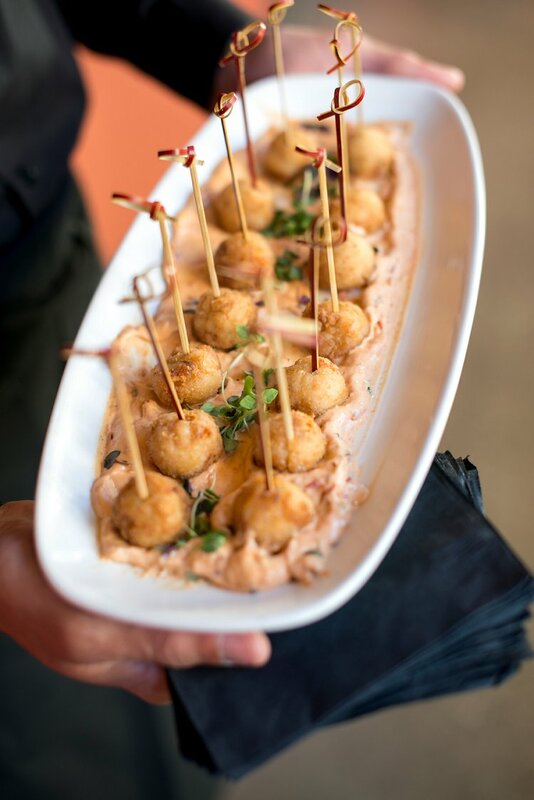 It was important to us that our celebration wasn’t just about us. Our parents have sacrificed so much for us and shaped us into who we are, so we wanted to celebrate them, too. 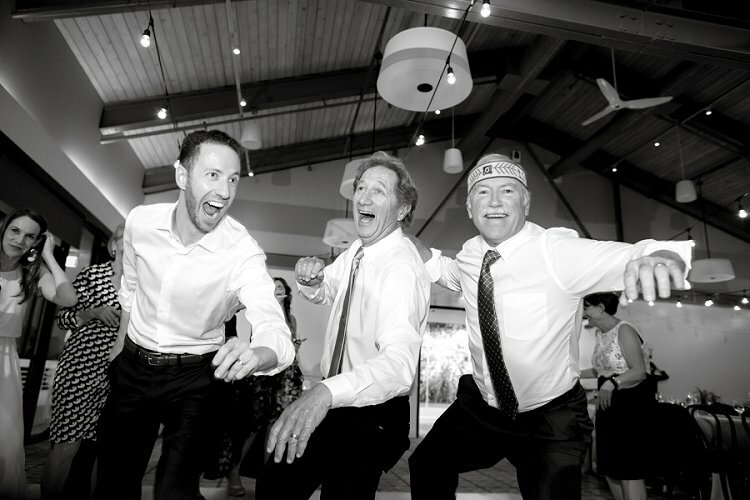 There is a photo my my dad during the hora that I love – it’s the happiest I think I have ever seen him. I’m going to cherish that photo and that moment forever. We rode from the ceremony to the reception in a Volkswagen van from Das Bus, as a nod to Bryan’s parents. 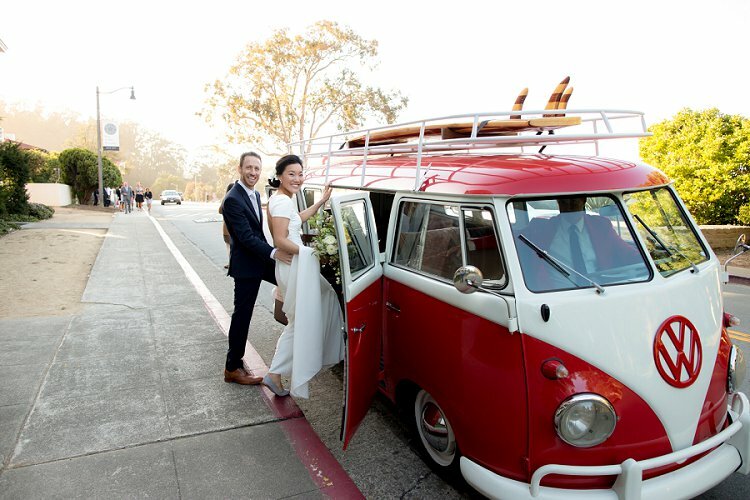 In the 1970s, they drove their Volkswagen van across the country from Long Island to the Bay Area, where Bryan and his sister Rachel grew up. Bryan is a big fan of podcasts, so our two sisters, Rachel and Keri, arranged a ‘wedding toast cast’ together during dinner. There were a few people who were unable to make it, including Bryan’s great aunt (and oldest living relative) and my best friend, who was expected to go into labor that weekend with her first child. They shared recordings from them in their speech, which was really special. 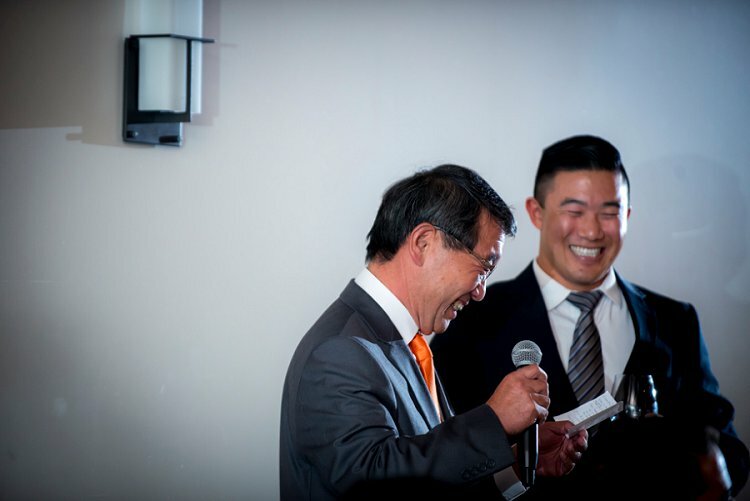 My uncle, who had flown out from Japan, and my little brother Derek, gave us a hilarious and boisterous Japanese banzai toast. 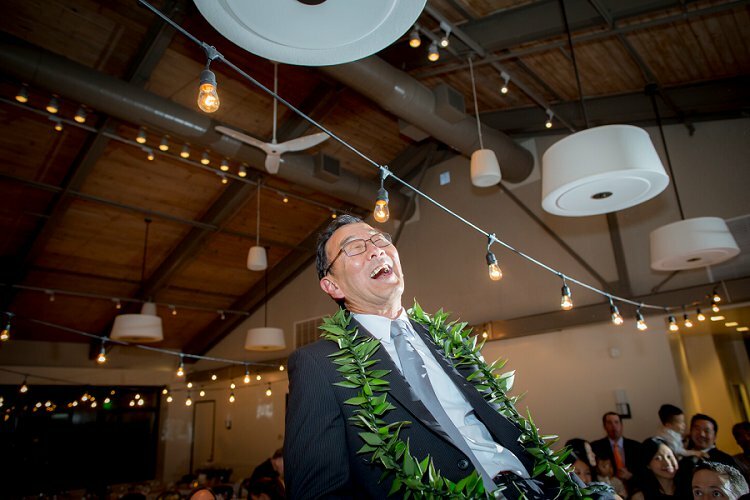 The banzai toast is a Japanese-Hawaiian tradition where everyone stands, lifts their glasses towards the bride and groom and yells “banzai!” three times in unison. It was the perfect way to end dinner and start the party. When I was a little girl, my cousins all had beautiful 1,001 origami crane artwork displayed at their weddings. I always dreamed of having my own one day. Before the wedding, my family and friends helped me fold 1,001 origami cranes (good luck in Japanese tradition) and I had it arranged into the shape of my mother’s family crest. 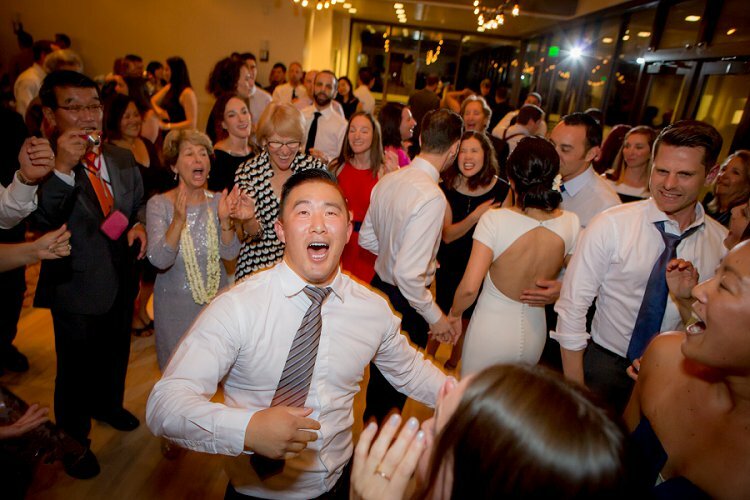 While this is not a traditional Japanese wedding ritual, it’s a tradition in our Japanese-American family. The crest now hangs in our living room, next to our ketubah, and is the logo for the company I started after our wedding. 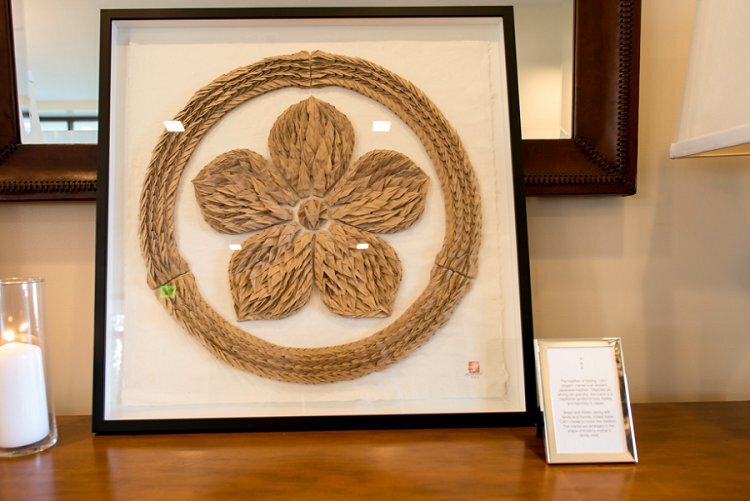 It was made by Linda Mihara of Paper Tree, a well-known local origami artist who grew up in San Francisco’s Japantown – the oldest in the US! 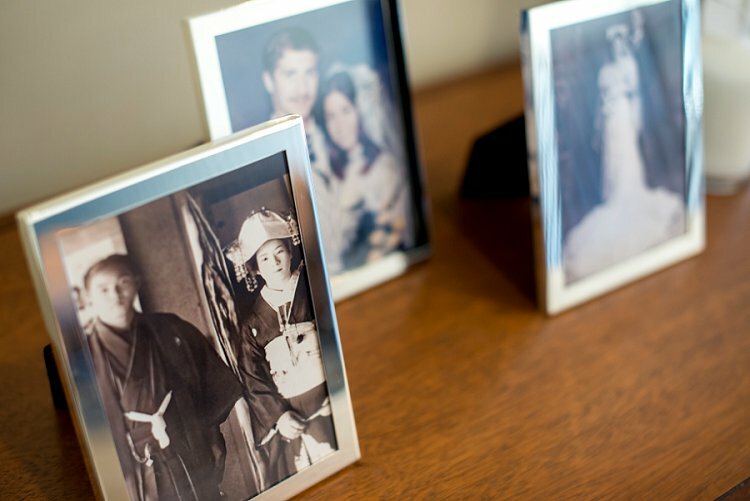 My father is third generation Japanese-American from Hawaii and my mother grew up in Japan. I’ve never been to a traditional Shinto Japanese wedding before, and all my cousins in Japan wore western-style wedding dresses. But I grew up going to Japan in summers. 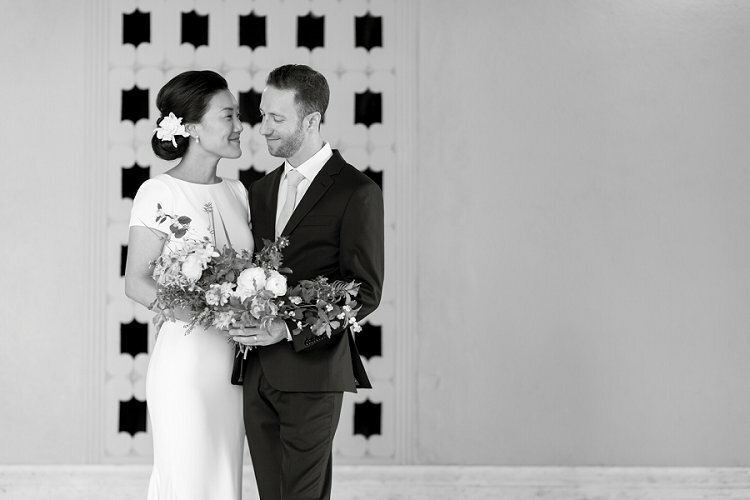 Incorporating Japanese elements into our day was really important to us, even if they weren’t “traditional” Japanese wedding elements. 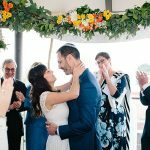 I searched the Internet for countless hours and found very few examples of Japanese and Jewish weddings that fit our style. 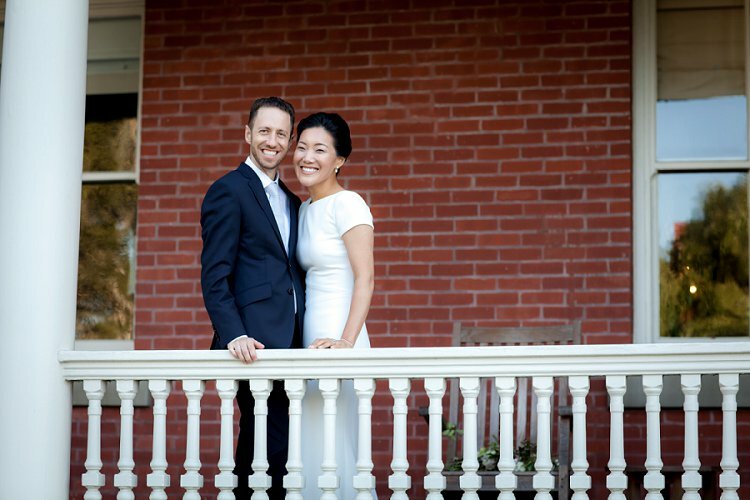 Eventually, we created our own unique take on the Japanese-Jewish wedding. 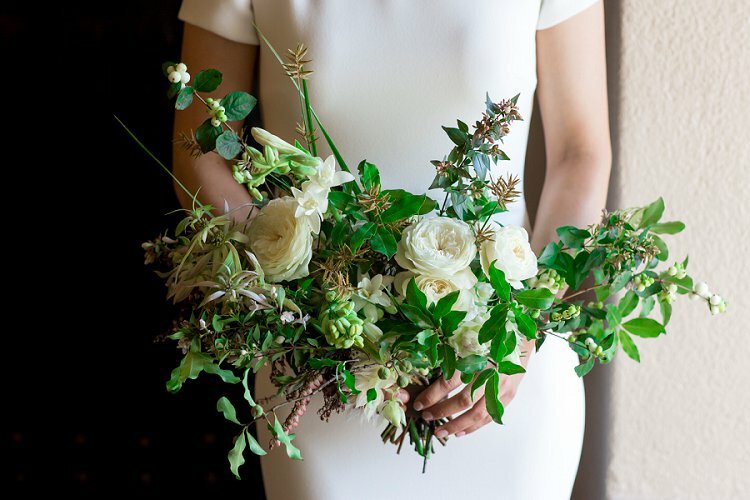 Our number one priority throughout the wedding planning process was to make every part of our wedding meaningful and in alignment with who we are. This required a lot of grappling with ideas and decisions, but we were so happy with how everything turned out. 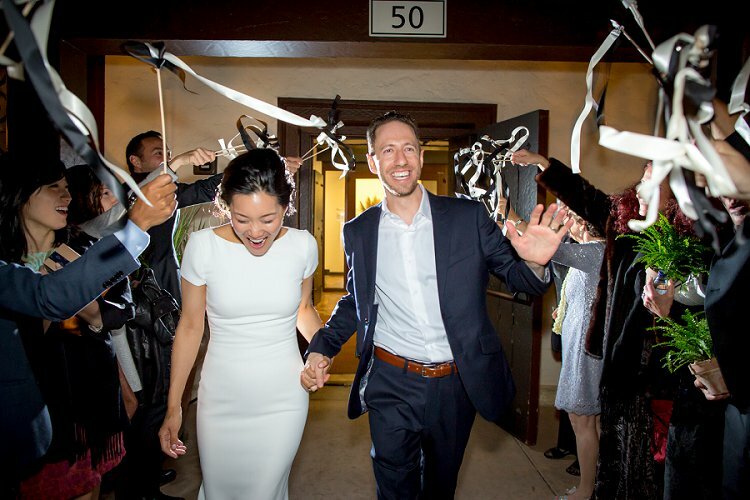 Our wedding was not traditional by any means, but it was so authentically ‘us’. Your family and friends love you and want to help and support you. I’m not great at delegating or asking for help, but our families are amazing and know me well. They helped us so much in the months leading up to the wedding, we can’t begin to thank them enough. Bryan’s brother-in-law, Steve, flew out to San Francisco for a long weekend, all the way from Yangon, Myanmar, where he was living at the time! We were so grateful and happy to have him be part of our special day.